The solution for fine sanding, finishing, polishing, deburring, roughing, paint or silicone removal as well as cutting. The secret for the strong performance of this very handy tool is the oscillating motion permitting extremely fine and delicate work or more aggressive performance, depending on the accessory used or material worked on. The oscillating motion prevents sandpaper from clogging and it even allows cutting! The powerful permanent magnet motor has a high lifetime and performs with high torque without vibration or kickback which ensures for impressive stock removal. The electronic speed-control allows for continuously variable speeds from 3,000 - 10,000 oscillations/min., so that the tool can be used on wood, steel, non-ferrous metal, glass, ceramics and plastics. Head of die-cast zinc, ensuring exact and stable housing for the moving parts. Main housing of glass-fiber reinforced POLYAMIDE. The sanding plate has an adhesive pad to accept sand-paper or fleece with hook and loop system to facilitate changing. Technical data: Volt 110 - 120V AC, 60 Hz, Max., Power 1/8 HP (100W), Speed 3,000 - 10,000 oscillations/min., Length 9-inch (230 mm), Weight 1.2 lb. (550g), Sanding plate dimensions: 2-1/2-inch x 2-1/2-inch x 2-1/2 in. 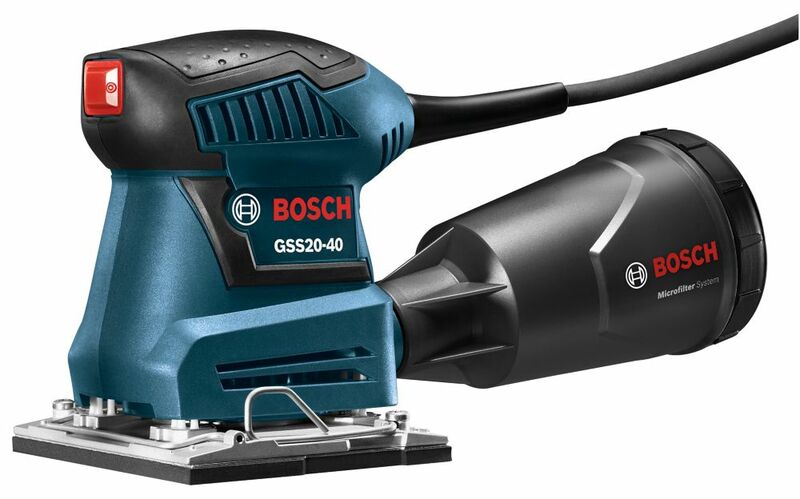 1/4-inch Sheet Orbital Finishing Sander The Bosch GSS20-40 1/4-inch Sheet Orbital Finishing Sander delivers even sanding and long tool life, with a precision-machined aluminum sanding plate. It has a beefy 2.0 Amp motor that produces up to 12,000 oscillations per minute (OPM), delivering uniform and smooth results on all surfaces. This tool incorporates low-vibration engineering for user comfort and for enhanced tool life. 1/4-inch Sheet Orbital Finishing Sander is rated 4.4 out of 5 by 20. Rated 5 out of 5 by Mr Dub from Great little sander. Repainting my sons place so pick this sander up for the job. Have had a couple others over years and found this to be the best of the bunch. Dust collector work really well compared to other. Fits good in the hand for operating. Reasonable quite. Would recommend it for sure. Rated 4 out of 5 by HomeDepotCustomer from Quite handy little pal sander. The problem I am... Quite handy little pal sander. The problem I am having with it is that the clips that hold the paper in place keep giving way and the paper comes loose. Do not know if that is a defect in my sander or a sandpaper problem. Will have to contact bosch about it. Rated 5 out of 5 by Kenneth from High Quality Tool I have only used this tool for approximately three hours. It is easy to control and to sand in positions other than horizontal. Vibration is minimal. Dust collection is satisfactory. Power is good. Rated 5 out of 5 by DPKinney from Another Great Bosch tool! I own two Bosch routers, one half-sheet sander and this 1/4-sheet sander. I have owned 1/4-sheet sanders before. They always lost grip on the paper. This sander, like the 1/2-sheet sander, never looses grip on the sand paper. The dust-protection works well but, I will be purchasing the adaptor for my shop vac. Rated 5 out of 5 by Mike from I just purchased this sander for work on the exterior of my house, built in 1955. I am sanding of... I just purchased this sander for work on the exterior of my house, built in 1955. I am sanding off multiple layers of poorly applied paint on 6" redwood over-lap siding. I use the sander on the horizontal V-grooves between the boards, and it does a great job. I'm using 60 grit, and I change the paper frequently. I am also using an older Bosch 3725 DEVS for the flat surfaces, and the prep project is going much faster than I expected. Bosch sanders are great. Rated 1 out of 5 by HomeDepotCustomer from Sander was supposed to be new. It was in fact... Sander was supposed to be new. It was in fact used and encrusted with dust. All of this in a beat up box. Return for full refund..